First of all, let me introduce to you our rescue pup, Winter. She is an approximately 5-6 year old Lab mix and weighs in at about 45 lbs. Everyone assumes she is a Lab puppy because of her size, but in reality, she is as big as she is ever going to get. 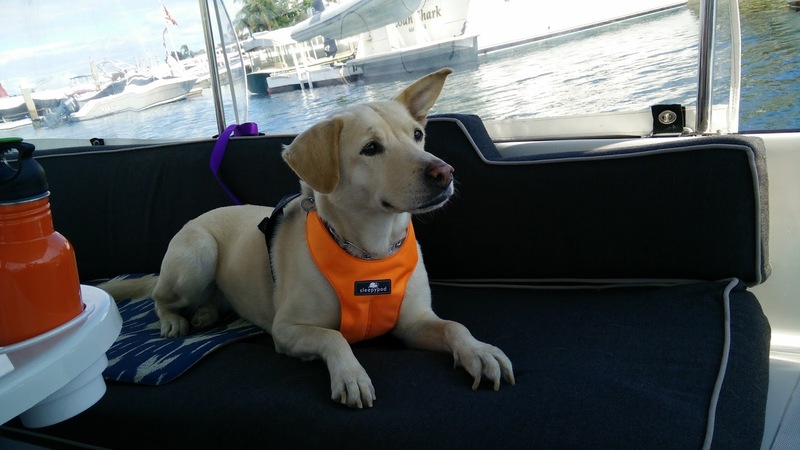 When we first got her, she was transported around town in the hatch area of our Focus EV, but after doing some extensive research, we have determined that the safest option is for her to ride in the cabin with us using a harness. To accommodate this, we acquired a Sleepypod Click-It Sport harness and a covering for the back seat of the car. While Winter is still acclimating to being transported this way, she seems much happier than she was in the hatch area where she had limited sun protection, although more freedom of movement. Luckily, everything we acquired for transporting Winter in the Focus was easily moved over to the MDX for our trip. 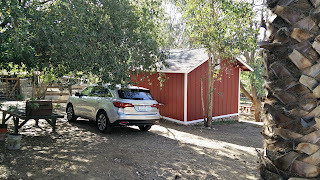 The only concerns we had were that the leather seats in the MDX might not provide as good a grip for the seat cover and that the seat height was a noticeable amount taller in the MDX compared with the Focus. Luckily, neither of these items turned out to be a major issue. The seat cover was well designed and ended up fitting perfectly. Using it in the MDX actually led me to realize the intention of the elastic cord sewn to the underside of the cover; by looping the cord around the seat, it helped to keep the cover in place. As for the seat height, all I can say is that Winter has hops and had no trouble jumping into the seat from flat ground. One thing that makes the MDX great for transporting Winter in her harness is that the center position seatbelt in the second row detaches completely from buckles on the seats. This allows me to actually use that belt and position Winter in the center of the seat, putting her in the most protected position in the vehicle, just as one would with a child seat. This feature is probably one of the best thought out features on the MDX, and not just for transporting kids and pets. It allows for proper 7-passenger seating when needed and for there to be no obstruction of the rear sight-line when not in use. When stowed into the roof, it becomes nearly invisible. Unfortunately, being mostly Lab, one of the traits that Winter has inherited is that she sheds. A lot. Worst of all, she is going through her seasonal shedding right now as the weather in Southern California has started to warm up pretty significantly. As a result, her fur tends to get everywhere in the car. 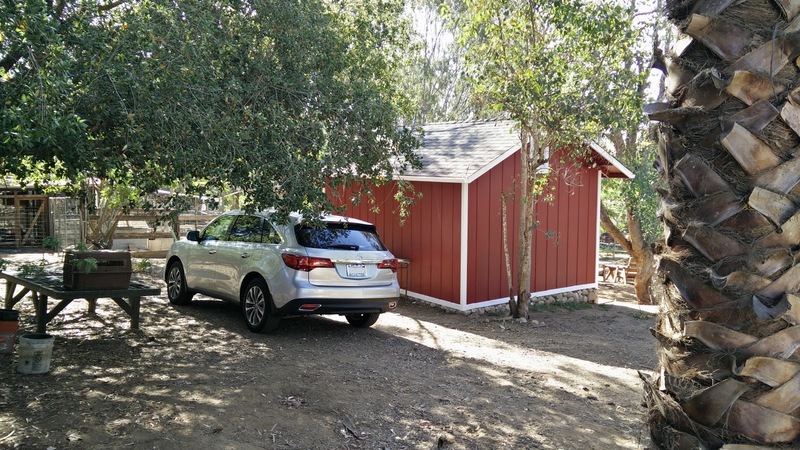 Since the MDX is not my daily driver, I felt obligated to keep it clean after we used it all weekend, especially since it saw quite a bit of dirt and dust on the outside as well. 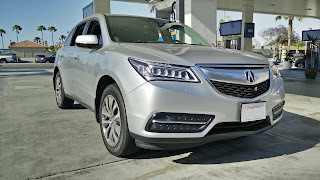 Fortunately, Acura's choice of materials inside and a simple clean design outside mean that the MDX is super easy to keep clean. Despite our best efforts, Winter's fur still got all over, but a quick pass with a vacuum at the local carwash was all that was needed to remove 99% of it. A quick hand-wash later, the outside was looking stunning under the waning sunlight of a lazy Sunday afternoon. Honestly, I can see the appeal of the MDX as a family hauler. It is always easy to drive, turns in decent fuel economy for its size, has tons of space, and is easy to keep clean. It is no wonder it is one of the best selling 7-seat crossovers available on the market today.